Prediction of malt fermentability (apparent attenuation limit – AAL) by measurement of the diastatic power enzymes (DPE), α-amylase, total limit dextrinase, total β-amylase, β-amylase thermostability, and the Kolbach index (KI or free amino nitrogen – FAN) is superior to the conventional use of diastatic power (DP) alone. 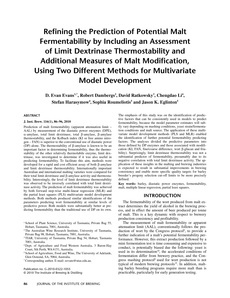 The thermostability of β-amylase is known to be an important factor in determining fermentability, thus the thermostability of the other relatively thermolabile enzyme, limit dextrinase, was investigated to determine if it was also useful in predicting fermentability. To facilitate this aim, methods were developed for a rapid and cost efficient assay of both β-amylase and limit dextrinase thermostability. Internationally important Australian and international malting varieties were compared for their total limit dextrinase and :beta;-amylase activity and thermostability. Interestingly, the level of limit dextrinase thermostability was observed to be inversely correlated with total limit dextrinase activity. The prediction of malt fermentability was achieved by both forward step-wise multi-linear regression (MLR) and the partial least squares (PLS) multivariate model development methods. Both methods produced similar identifications of the parameters predicting wort fermentability at similar levels of predictive power. Both models were substantially better at predicting fermentability than the traditional use of DP on its own. The emphasis of this study was on the identification of predictive factors that can be consistently used in models to predict fermentability, because the model parameter estimates will subtly vary depending on mashing conditions, yeast strain/fermentation conditions and malt source. The application of these multivariate model development methods (PLS and MLR) enabled the identification of further potential fermentability predicting factors. The analyses divided the predictive parameters into those defined by DP enzymes and those associated with modification (KI, FAN, fine/coarse difference, wort β-glucan and friability). Surprisingly, limit dextrinase thermostability was not a substantial predictor of fermentability, presumably due to its negative correlation with total limit dextrinase activity. The application of these insights in the malting and brewing industries is expected to result in substantial improvements in brewing consistency and enable more specific quality targets for barley breeder’s progeny selection cut-off limits to be more precisely defined. barley, diastatic power enzymes, fermentability, malt, multiple linear regression, partial least squares.